After you juice a grapefruit, lemon, lime, orange or other citrus, do you throw it away? If so, you’re tossing out a delicious ingredient: the zest. Zest is the outermost part of the rind/peel/skin. Before you juice the citrus, remove the zest for use in other recipes. 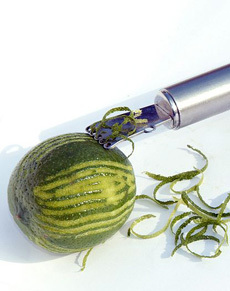 Scraping or cutting it from the skin is known as zesting. Add zest to your recipes: in baking, casseroles, marinades, rice, salad dressings, sauces, soups, stir frys and stews. Perk up uncooked foods: from green salads and tuna/seafood salads to yogurt (plain and fruit-flavored). Steep it with tea. A piece of lemon peel is traditionally served with espresso, so you can add some lemon zest in your coffee, if you drink it without milk (the acid in the fruit curdles milk). Dry the zest for cooking and baking. Set it on paper towels or wax paper overnight; then store it in a recycled spice bottle. Save empty spice bottles so you can store different types of peel. Zesting a lime. Zest got its name from the “zestiness” it adds to food. Photo by Villy Fink Isaksen Wikimedia. Make gremolata, a flavorful condiment of fresh lemon zest, minced garlic and chopped parsley. Here’s the recipe. Gremolata adds so much flavor, you can reduce the salt. Make lemon butter: a compound butter that can be used atop grilled fish, shellfish and vegetables; on canapés; creating maitre d’hotel sauce and other uses. Make zesty ice cubes. Keep a “lemon ice cube tray,” adding some zest to each compartment. As the ice melts, it adds flavor to cocktails, iced tea, soda and (of course) lemonade/limeade. Add zest to sorbet. Along with the fruit’s juice, it will add intensity of flavor plus texture and eye appeal. Or, sprinkle store-bought sorbet with strips of zest. The fresher the zest, the more aromatic and flavorful; so don’t let it wane in the fridge. Be sure to wash and dry the fruit well before zesting. If you can, buy organic or unwaxed citrus. While some people use a paring knife, it’s much easier to use a zester (which creates julienne strips) or a zester grater like a Microplane, or the fine side of a box grater. First decide how you’re going to use your zest: grated or strips. If the zest will be used for flavor and then removed (marinades, steeping in tea) it doesn’t make a difference. For garnish/eye appeal, use a regular zester. To dissolve into recipes (vinaigrette, sorbet) use a zester grater. We love our Cuisipro box grater. If you’re going to buy a zester, get a combination zester-stripper, which also creates strips of peel for cocktails or garnish. What are your favorite uses for lemon zest?